Members of Catch 22 have been performing together for the past twelve years. Irina, female leader of the band and a Russian Conservatorium graduate (keyboards and lead vocal), and the guitarist/bass player have worked on cruise ships for seven years, entertaining people from all over the world, of all ages and requirements, including the Mediterrranean, Pacific, United States, Asia and Europe. 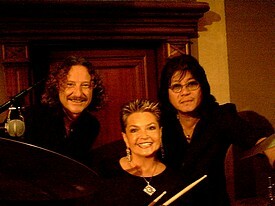 In Australia the band has performed in international hotels, function halls, restaurants, clubs, cruise ships for dinner dances, weddings, balls, parties, corporate and ethnic functions, presentation and cocktail parties, diplomatic events (for Governor General and Consular Core), graduation balls, etc. The repertoire is very extensive and versatile - traditional to contemporary - consisting of Jazz standards, Continental, Latin American, Beatles, Ballroom Dancing, Pop and Rock, Blues and Top 40, and features three part vocal harmony. Catch 22 have excellent knowledge of National Jewish Receptions (traditional and contemporary) and the ability to perform in English, Russian, Italian, Spanish, French, Portuguese, Ukrainian, Japanese, Yiddish and Hebrew.